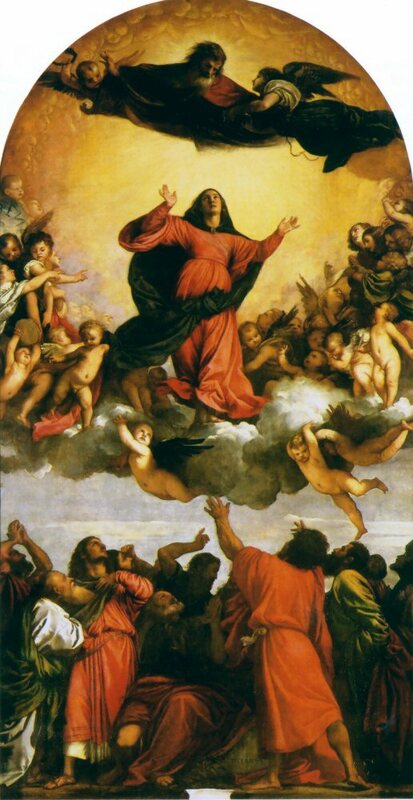 The Assumption of the Blessed Virgin Mary | Feast! On August 15th we celebrate the Assumption of the Blessed Virgin Mary—when she was taken up to heaven, body and soul. This is not a new idea but a very old one dating back to at least the 5th century. On this day we honor our Blessed Mother and are filled with hope that we, too, will experience the glory of Christ’s presence in heaven as Our Lady does. Partly because of the time of year that it is celebrated, summer harvest foods are traditional for this Feast, particularly herbs and fruit. Our menu consisted of “Assumption Salad” with oranges and dates, Stuffed Zucchini, and Baked Stuffed Apples with Butter Rum Sauce. 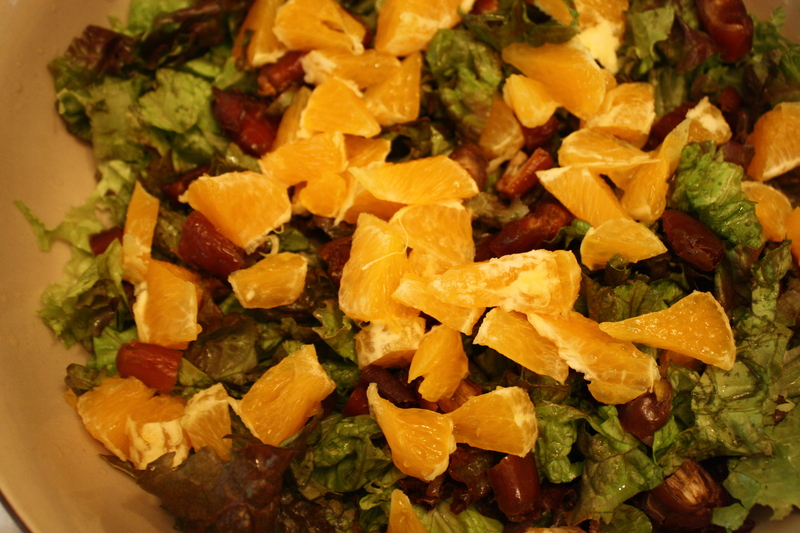 We chopped up pretty red leaf lettuce and added orange slices and dried dates on top. We made a simple dressing from Olive Oil, Balsamic Vinegar, Grapefruit Juice, a little sugar, and fresh ground pepper. I got the idea for this salad from the “Morraccan Salad” recommended for the Feast of the Assumption in Brother Victor Antoine D’Avila-LaTourrette’s Sacred Feasts. I LOVE all of his cookbooks. They are meatless, seasonal, and delicious. However, because his monastery is in New York, we usually have to make alterations so that the recipe will be seasonal for us in North Florida. 3 Zucchinis: split lengthwise and scoop the seeds out, then use a spoon to remove some of the flesh to save for the stuffing. Don’t get too close to the skin, though, because you want a sturdy shell to stuff with the other veggies and meat. 1 Onion (chopped): Cook together in a deep pan until meat is browned. Fresh herbs! (We had fresh Oregano, Thyme, Sage, and Rosemary thriving in the front yard): Add all these to the pan along with the left over Zucchini you reserved. Stir it around for 5 minutes or so. Add to filling and stir in. 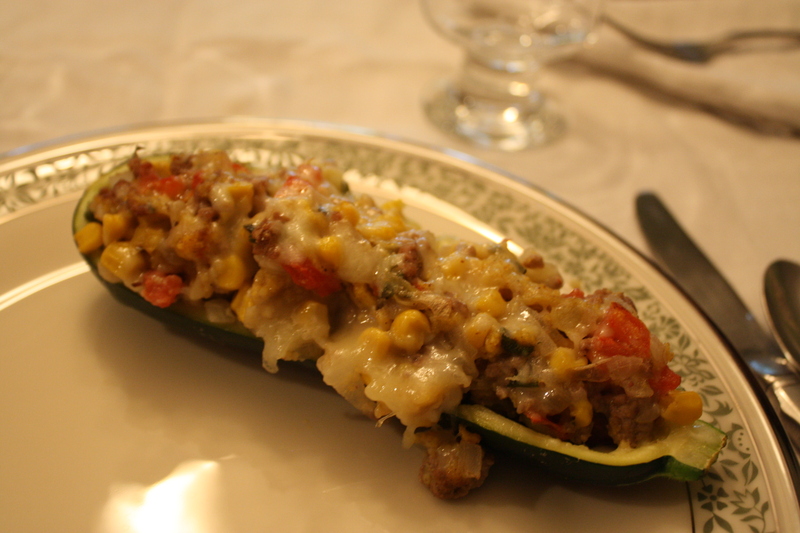 In a baking dish stuff Zucchini shells with the filling. Bake for 20 minutes, then add more shredded cheese on top. Continue baking until you think the shells are tender. I had aspirations to do Stuffed Pears as my friend Helen told me that they are a traditional Assumption Day food in Greece and Italy. Unfortunately, it’s just not pear season here and the ones available at the grocery store were looking pitiful. 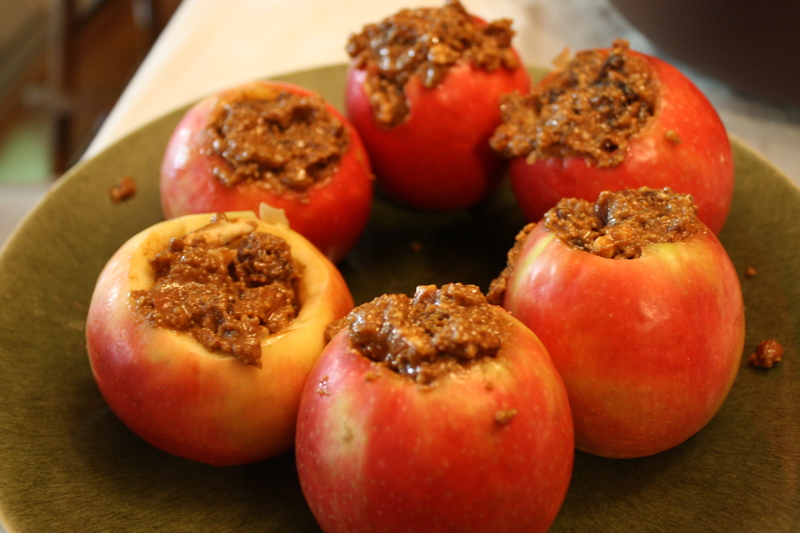 So…Stuffed Apples it is! Just mix them together and stuff the filling into the wells you made in the apples, then stick them in the oven in a baking dish with just a little water in the bottom of the dish. Leave them in there until you think the apples are tender. I think it took close to an hour for ours to be ready. While they’re baking, whip up a Butter Rum Sauce. Reduce heat and simmer 5 minutes, stirring frequently. Remove from heat and add 6 TBSP Rum. 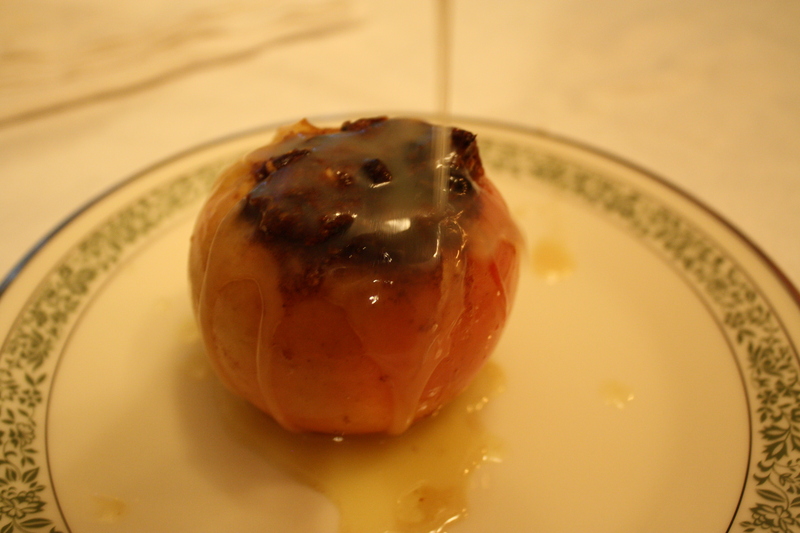 Drizzle this sauce over the apples when they come out of the oven.